I am super excited to be kicking off the Fairyland blog tour - You may recall, I am a fan. And I got to reveal the trailer to y'all (which you can see again - or for the first time, if you haven't why haven't you - in Cat's guest post/giveaway). What can I say that I didn't already say in my review of The Girl Who Circumnavigated? When I finished the first book, it felt complete. That's not to say there wasn't room for more, but it felt like it easily could have been a somewhat open-ended stand-alone book, and I was happy about that. But that doesn't mean I wasn't tickled to death to hear there was a book two - and that it dealt with September's shadow! In fact, I wasn't even nervous going into this that it was going to be a lesser book than the first, as I often am with sequels and 2nd-in-a-series books. I went into this fairly confident that Valente would masterfully avoid the Sophomore Slump, and I think she did. The Girl Who Fell is just as strong as its predecessor, but with a with a more mature, more insightful September at the helm. Now, I think some people are going to find this a little...hmm - harder? to connect to; I think they'll find it less whimsical and a bit darker, and September a little more serious, and they may interpret that as the story losing some of its magic and charm. But I don't think that's the case, and I personally found it the opposite. I think it's simply that things have changed. September is older now (as our narrator coyly tells us, she now has the beginnings of a heart), and her perception and experiences are different. She's more thoughtful - and more hesitant - which I think for some readers will mean the magic is starting to die. Which in the scope of all things fairy is generally true - the older you get, the more it slips away... But September is still September, even though everyone around her is a shadow of what they're supposed to be (literally), and I think she still comes through very strongly. I actually really really love that September is starting to grow up (as much as we may not want her too); this makes her so much more authentic, AND ALSO this means that a younger audience reading this can potentially grow alongside September and relate to her, and that gives me Happy Reader Shivers. But even if September is a little older, a little wiser, and a little more introspective, the fact remains that she's still September and she's still going to do Septemberly things and approach the world (both "real" and Fairyland) as only September would. And frankly, Fairyland-Below = awesome. It expands the world of Fairyland really nicely; familiar characters popped up in unexpected ways, and new characters crept in - many of them fleetingly so, as in the way of the first book, but what's so wonderful is that even the minor characters who just pop up and disappear are never confusing. Instead, they make the world full - everything has a place, everything has a purpose, and everything comes into play. The struggle with the shadows and with Halloween (the Hollow Queen, ie September's sort-of-stolen shadow) are just fantastic. I loved that nothing is ever easy/black and white. I love that you begin to feel for the shadows and for Halloween just as much as you do for their tangible counterparts. I LOVE the idea of everyone's shadows just hanging out, being a part of you but never really getting to experience, never getting credit, never getting to do their own thing. The bittersweet, melancholic streak I talked about (and loved!) in Circumnavigated is stronger in Fell (shortest yet), and perfectly suited to Fairyland Below, AND to where all of the characters are now; it's not just September who has grown and changed, but all of the characters - even some you may not expect. Valente is still the Queen of Nonsense, and I still mean that in the best of all possible ways. As far as I'm concerned, she always will be. So if you've read The Girl Who Circumnavigated Fairyland in a Ship of Her Own Making and liked it, you should pick this up. If you haven't, you should do that. But if you can't pick it up just yet, maybe read this Fairyland short story to tide you over? And don't forget to check out the other stops on the tour here! I can't wait to read this! Great review, Misty. I like how you focused on September growing up, because that really is a bad thing in Children's Lit., isn't it? It's not surprising that Valente's tackling it, especially after tackling many old and loved children's lit. tropes in Circumnavigated. Yay, I love that trailer for the first book and am so happy to watch it again! Can't wait to read this one, and glad to hear it lives up to the first book-- which I thought for a long time was a stand-alone. 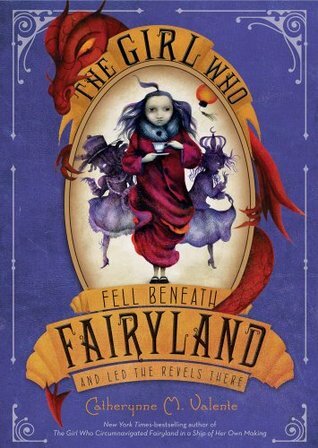 I'm looking forward to reading The Girl Who Fell Beneath Fairyland. There is a whole different tone to the book trailer for this one, and according to your review, the story has a darker feel to it. Can't wait to see how September and Fairyland have changed. I'm so looking forward to this. I'm excited to see how September is growing with her beginnings of a heart. I've seen a lot about Circumnavigated, but I'm a bit hesitant to give it a try. Nonsense doesn't always work for me. I've tried Hitchhiker's Guide to the Galaxy Twice and both times was let down by its scattered randomness. Sounds like a fantastic read. I still need to dive into the first book though. Great review Misty. Can't wait for this book! I loved the first one. I loved the first book. This review is wonderful in letting me know how the second compares and giving me a hint of what is coming. I'm excited to read The Girl Who Fell -- Thank you! Oh, I really like the idea of this book being darker! I absolutely adored the first one and can't wait to read this one. I like that there's a change in tone and it isn't really black and white. Fantastic review! Thanks for the great review! I loved the first book and I'm glad to hear this one is great too. Gotta love the nonsense : ) Can't wait to read it! I love that you love these books. I read the first one and the prequel, but I haven't had the chance to read the second one yet. I'm looking forward to it though! I haven't read the sequel yet, it sounds like I might enjoy it even more than the first. I will have to check it out. Can't wait to read these books! Your reviews are very good. You base your thoughts on solid reasons, not simply "read this book because it's good." I like reasons. I like that you are good about voicing what you did like, and also what you didn't like. It makes it much more interesting that the reviews by people who rave about books or just hate everything. Great review! Shadows? A darker story? A Hollow Queen? FACETS?! Stop. Please stop. You're killing me with want. This is why I can't read reviews of book I haven't read. They make me want to drop the book(s) that I'm reading and pick up the book being reviewed. Awesome trailer! The series is on my TBR list. super duper excited if I can manage to get my hands on this series of books! I JUST finished reading Fairyland #1 and I had no idea books 2 and 3 were already out until I saw your post! Ahh I was a bit afraid to read this review. I haven't read the series yet but I am really really excited to get into it! I love that September will evolve as a person as the story progresses. I rarely read series but the ones that I can remember (Libba Bray's Gemma Doyle trilogy-if I remember correctly you were not a fan...don't scold me! lol. And Francesca Lia Block's Weetzie Bat Series) I appreciated the Protagonist becoming wiser...more mature as the series continued. Also on a random note, I looove the cover art for Valente's series, its ridiculously gorgeous! I absolutely love everything about this series. The furthest I've ever driven for a book signing was 250 miles....I may have to make an exception if Cat Valente doesn't come south.